Are you looking for what’s next in the world of Augmented and Virtual Reality? SIGGRAPH 2017 showcases some of the coolest ideas in interactive techniques. This is a chance for you to see – and feel – tomorrow’s technologies. The Virtual Reality industry is expected to grow at a faster rate than any other Entertainment and Media industry between 2016-2021. At SIGGRAPH 2017, you can experience first-hand the latest developments in these emerging technologies. The Emerging Technologies Program at SIGGRAPH 2017 is presenting work that moves beyond digital traditions. Companies will be demonstrating the ways they are approaching the biggest problems in AR and VR, and solving them. For us this is touch. An intuitive solution, which is needed. Why is touch important in AR and VR? A new era of design is dawning. Where we design immersive 3D experiences using voice control, AR and VR technologies, and where we can interact and feel virtual objects. The importance of touch is critical to how humans experience the world. With Ultrahaptics’ mid-air haptics technology you can create virtual reality you can touch – enabling virtual experiences that truly differentiates. Our game-changing haptics technology is featured in two demos at this leading conference, step right into a virtual reality experience with Intel and Immersion S.A.
Intel is showing their Mid-Air Interaction with a 3D Aerial Display demo at SIGGRAPH 2017. Previous 3D displays have always prevented users from being able to touch and reach inside the display. If something looks physical, your intuition is to be able to touch it, but because holograms are not solid and the hand is, you’re unable to. Intel’s project allows you to interact with 3D floating objects using our haptics technology, allowing the user to ‘feel’ the object. Without any need of a VR head-mounted display, or haptics gloves. The results are striking and are being demoed for the first time at SIGGRAPH. The demo highlights applications scenarios that require 3D spatial manipulation such as viewing 3D scans, previewing 3D prints, and product design. Also showcasing at SIGGRAPH as part of the Emerging Technologies Program, is leading European AR and VR solutions company, Immersion S.A. We are involved with their R&D lab and the Touch Hologram in Mid-Air demonstration adds a method for touching objects, combining a Microsoft HoloLens head mounted display, with an Ultrahaptics Evaluation Kit. 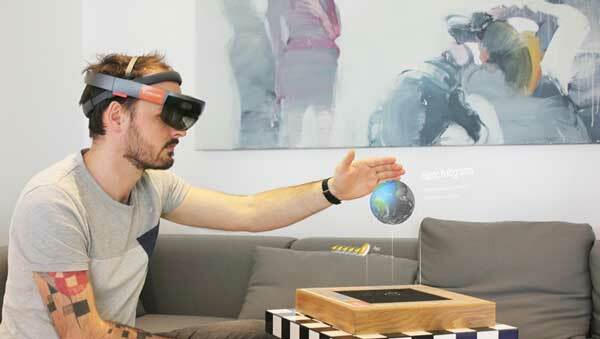 By giving a physical presence to intangible objects, it allows the user to touch the hologram. The result is a hologram of the Earth that the user can see through the headset, spin and feel mid-air feedback through the Ultrahaptics array. 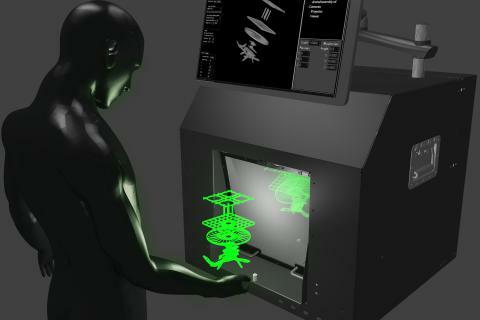 Touch Hologram in Mid-Air is a singular and surprising experience that illuminates a broad field of future research.